It’s been 1 week since we launched Vanilla 4.2, and result is going beyond our expectation. Using our Vanilla4GoogleAnalytics package, I can monitore the evolution of people coming on our WebSite (+420% of unique IP address compare to january 2012 as date of this writting) and number of download is also more than correct (more than 200 downloads for Vanilla platform in 1 Week … it’s quite reasonable). What is amazing also, when I look at statistics, is the geographical origin of persons connecting and downloading Vanilla. It’s true France and European countries (Germany, England and South European Countries) are those who are making the trafic, but Asian Region and USA are just behind. Funny to notice we got now a growing number of persons downloading from China, which was not the case with previous version. With Vanilla 4.2, we are providing more than Bi : Etl, Worklflow and Document Management are there, NoSql and Hadoop support are also important subjects with 4.2 … no mater what .G is thinking about our strategy and market position … what is important for us is customer recognition … and 1 week after the 4.2 launch, the sun shines bright … change the way you are thinking how you will manage your data … just turn to Vanilla now ! Vanilla 4.2 is now available for download. 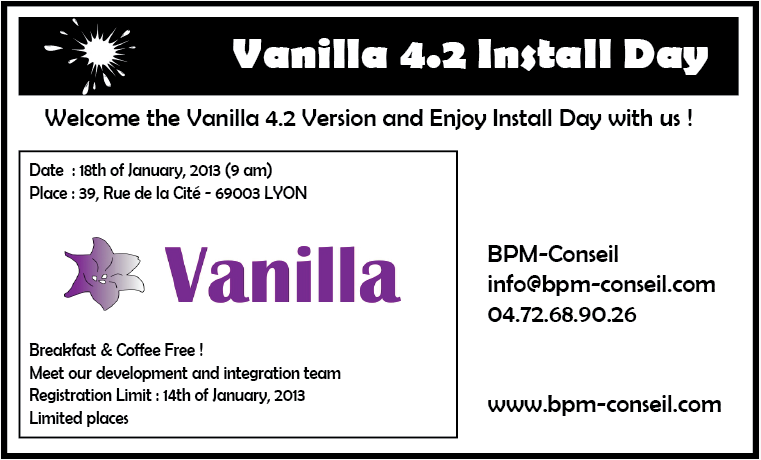 Just go to Bpm-Conseil WebSite to download the Vanilla platform. When we introduced Vanilla 4.2 new features list and during first presentation to early adopters, there is something that comes always has a remark : “Vanilla 4.2 is not a simple update, it can be considered as a new release, like a version 5.0”. That’s a point of discussion. So, we started the development of Vanilla 4.2 version, and because of 4.0 success, we had a lot of subjects to cover : training session, project development, project management … and some technical subjects went on board like Java7, Solr/Lucene, new Android and Ios versions, new Birt version … which lead us to delayed the release (summer is not a good period to delivere a release … we originally target october 2012 … but sometimes, it’s better to take 2 more months …). It’s been a crazy year to manage version 4.2 … and thanks to Vanilla team, we were able to delivere it, nearly on time. Along with the development team, we have also the integration team, that spent a lot of times in testing the software, writing documentation and sharing about interface quality. … It’s a real human experience to manage such project, and all the team should be proud for the result. We all learnt a lot during this year : about software, about project … about ourself, about team life. It was a nice journey and we are now expecting to get faster recognition from new customers – our current customers are our new version early adopters … showing our belief in our new version. This coming sunday is Vanilla 4.2 official launch. To follow this event, and offer an opportunity to people to start using Vanilla 4.2, we organise a full day in our office in Lyon where people can come and get information on Vanilla, like a full day of exchange and discovery. It’s our first try to organise such “Install day” event, as we like to meet our users (as opposed to basic WebMeeting, which are also usefull, but … you just talk to a computer !!! ).